Two kids were killed in a multi-vehicle accident on I-55 north of Lincoln, Ill. Sunday afternoon. 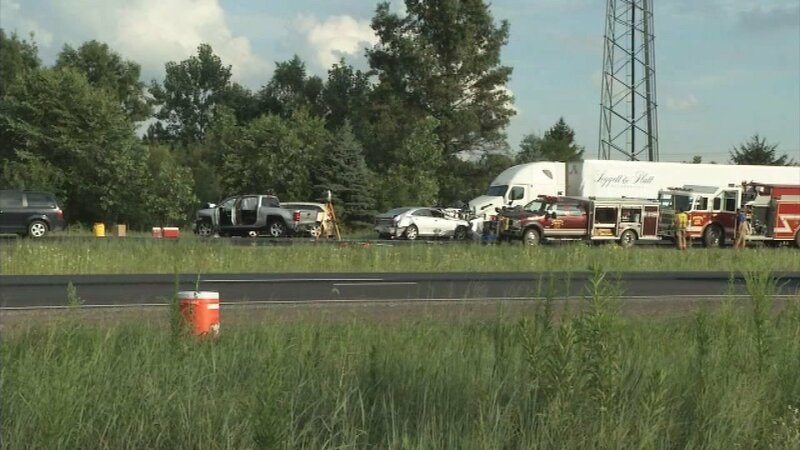 LOGAN COUNTY, Ill. (WLS) -- Two children traveling in a van driven by a Chicago man were killed in a six-vehicle crash on I-55 in downstate Logan County, Illinois State Police said. A white semi, driven by a 24-year-old man from Purcell, Mo., struck a silver Honda van, driven by a 40-year-old man from Chicago, in the northbound lanes of I-55 at mile post 138 just north of Lincoln, Ill., just after 3 p.m. Sunday. The van then hit another four vehicles. Two children, ages 2 and 4, who were riding in the van were pronounced dead at the scene. Police have not released their identities. A third child inside the van was transported in critical condition to OSF Saint Francis Medical Center in Bloomington, Ill.
Two other people were airlifted to nearby hospitals. Authorities did not release the ages or genders of those people. Five of the vehicles had extensive damage and were towed from the scene. A sixth vehicle was able to be driven away. The northbound lanes of I-55 were closed for several hours while troopers conducted an investigation. Authorities said everyone involved in the crash was using seat belts or child restraints. Charges are pending further investigation.